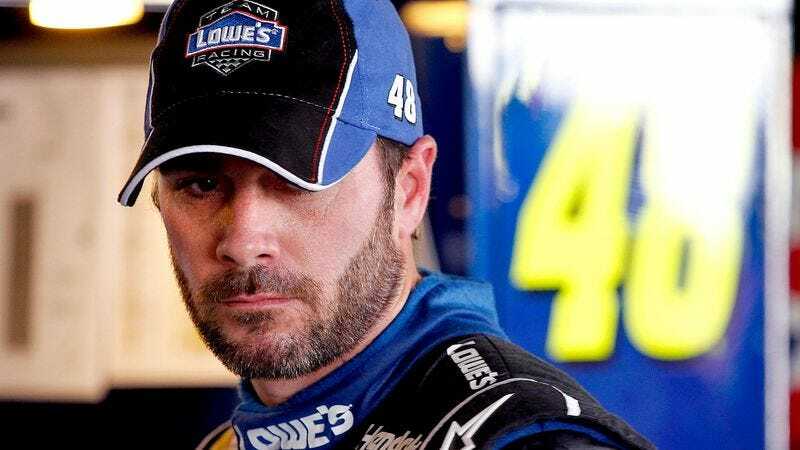 RICHMOND, VA—Following a pre-race inspection, NASCAR officials announced Friday that the car to be used by Jimmie Johnson's Hendrick Motorsports team at Richmond has been disqualified from Saturday's race because the Lowe's Chevrolet was found to be a Gulfstream G550 jet. "The No. 48 car's nose was narrower than our templates, so I can see why they thought they might get this past us, but it came in 44,800 pounds overweight, had giant wings, and wasn’t even powered by internal combustion," said Sprint Cup Series official John Darby, who acknowledged that Johnson's vehicle had been equipped with a pushrod V-8, but scrutineers discovered the engine was just sitting in the aisle and not connected to any sort of drivetrain. "We have these rules to keep the competition fair and, more to the point, to keep the drivers safe, and no roll cage, window netting, or harnesses had been put in. We wouldn't even let anyone near this thing… Nothing was done to help anyone survive a crash." NASCAR said it will investigate further before deciding on penalties, but a closer look at footage showed Johnson's car has been flying through the air most of his career.